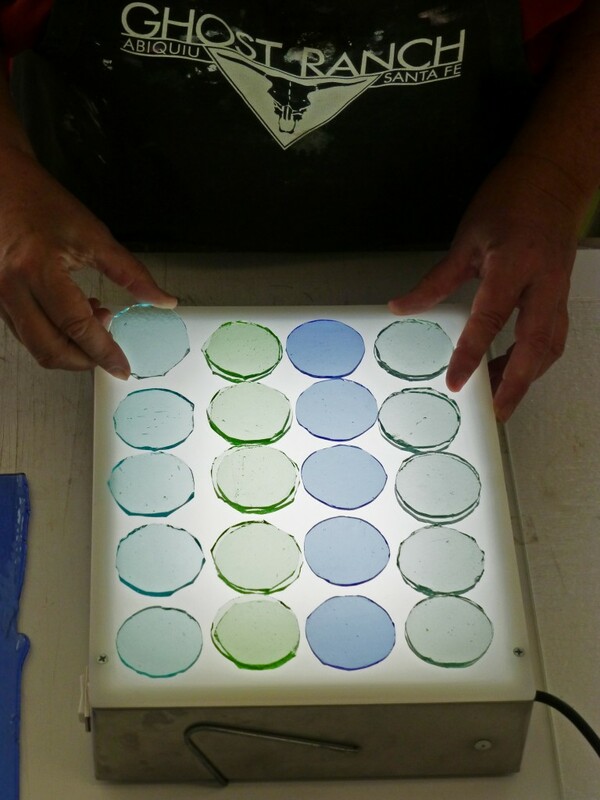 Alison MacDonald of ACKfire studios gets the replacement glass jewels ready for the Watch Room skylights/Lantern Room floor panels. We’re getting down to the fine details now. 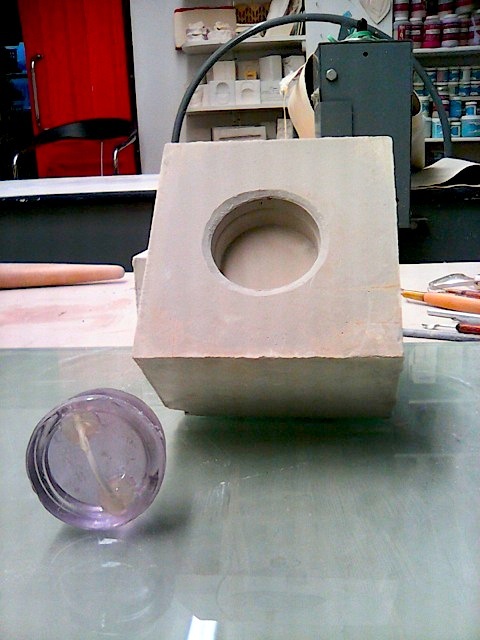 The missing glass jewels that form the skylights for the Watch Room ceiling and the floor pieces for the Lantern Room are now being cast. 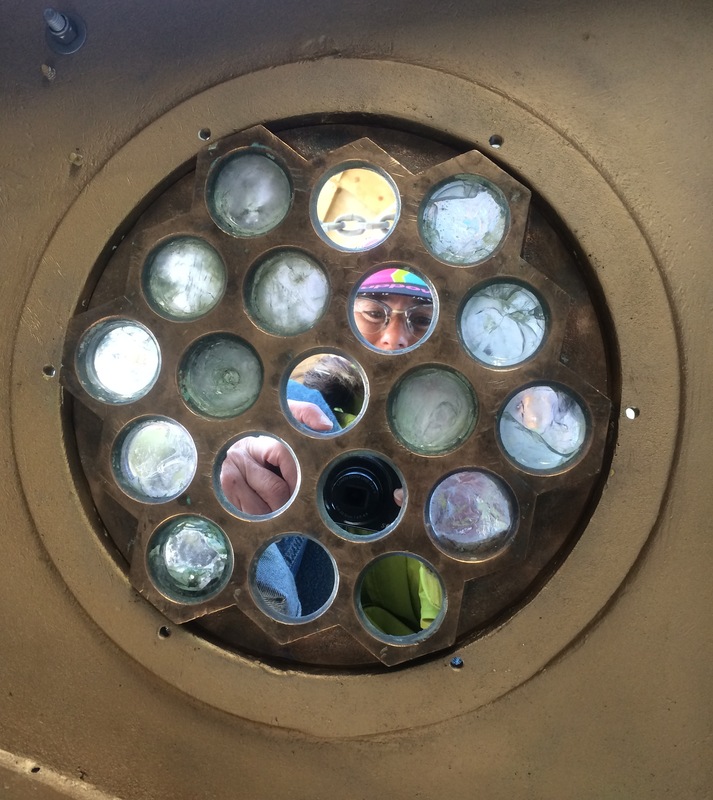 The Nantucket artisans at Ackfire Studios are hard at work right now creating replacements for the missing heavy glass jewels embedded in the round bronze skylight frames. 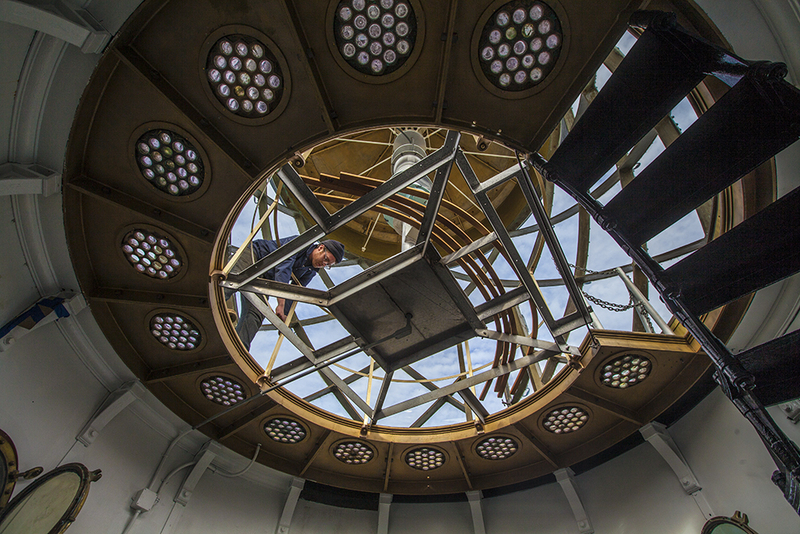 Alison MacDonald of Ackfire visited Graves Light in April to examine the job and take measurements. Now, the colored glass disks have been cut and are being cast in tiny molds within a large kiln. We love our local artist community! 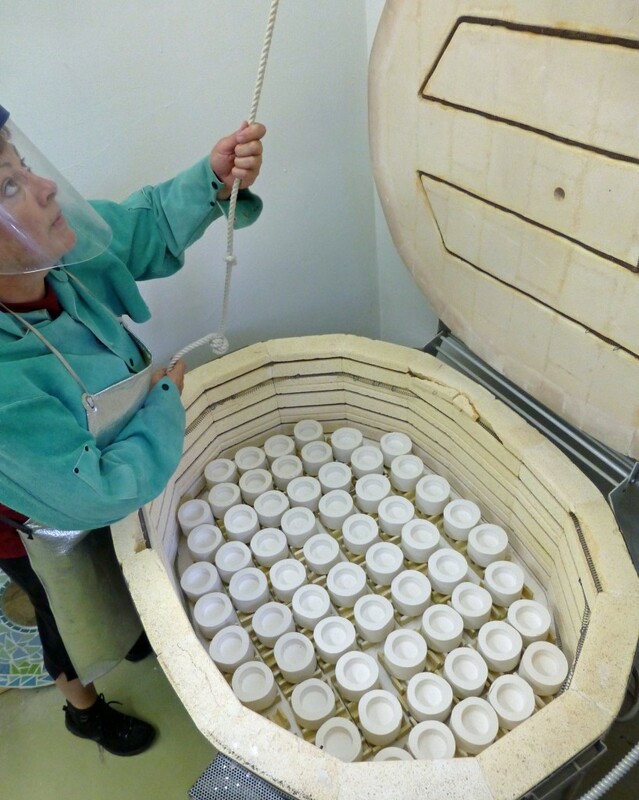 Here is the Ackfire crew cutting individual discs of glass which will be melted and formed in these little molds. The resulting glass jewels will be glazed into the lantern floor this month. These glass pieces are reproductions of the missing original glass from the 1903 architectural design, and are copied from the remaining originals. John builds the bronze lantern railing so that we can have an open area and still keep the beacon secure as a US Coast Guard aid to navigation. Without a doubt, the most beautiful feature of Graves Light is the lantern, the glass room which housed the great Fresnel lens. 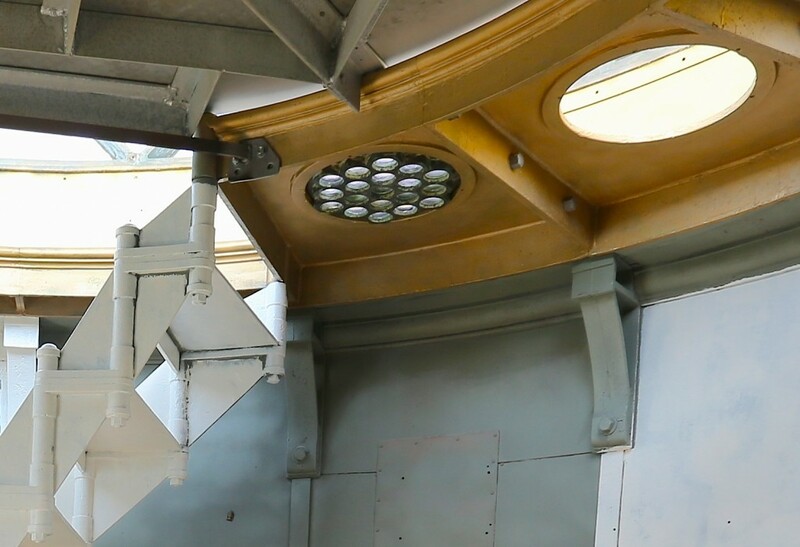 Built into the cast metal floor are 13 little round skylights that were the sole source of natural light for the Watch Room below. The years have been kind (the heavy glass has turned from clear to a purply sun-colored amethyst) and unkind (several of them are missing or broken). Not a problem for Alison MacDonald of ACKFire Studios. 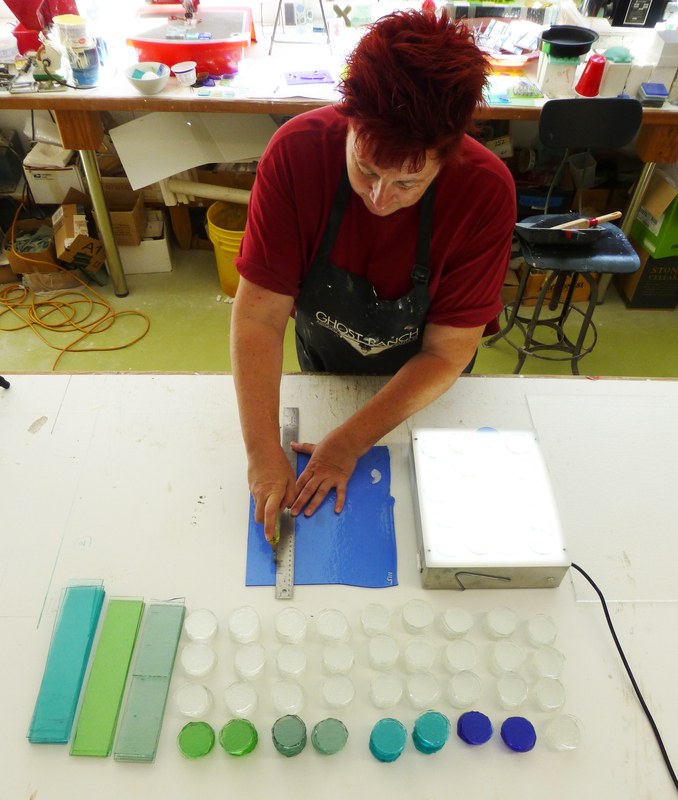 Using one carefully removed glass tile, Alison has created a mold in her Nantucket glass studio and is busy reproducing the missing pieces. We hope to report that by end of summer, the skylights will be fully intact again and ready for the next century of use. Original US Light House Service architectural floor plan of the lantern deck of Graves Light, 1903.